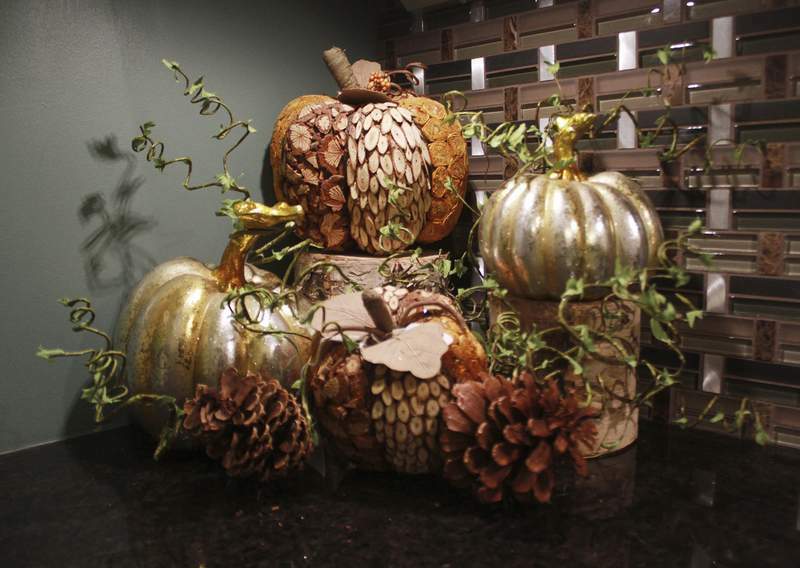 Rachel Von | The Journal Gazette A new trend in Halloween decor expands the color palette, including a harvest theme display of gold and metallic- colored pumpkins at Choice Designs in Fort Wayne. Rachel Von | The Journal Gazette The chic steam punk Halloween display includes a lace pumpkin and sculptural metal orbs at Choice Designs, 3223 Carroll Rd. Fort Wayne, IN on Monday. Rachel Von | The Journal Gazette The chic steam punk Halloween display includes a glass skeleton head at Choice Designs, 3223 Carroll Rd. Fort Wayne, IN on Monday. Whatever happened to the days when plopping a plump pumpkin with a face carved into it on the front porch was enough for Halloween decorating? Gone into the abyss. Now there are giant blow-up hell hounds and scary clowns for the front lawn, strings of lights shaped like skulls for the family room, animated corpses that rise from their deathbeds for, well, we don’t quite know why. And a slew of giggle-worthy goblins and wacky witches for those who’d rather have their Halloween a little less scary. And, Fort Wayne area merchants say, the last few years have brought a third category for Halloween decor. It’s for those who want their decorations to read more "Chic!" than "Eeek!" "We don’t do a lot of the real kitschy stuff anymore," says Abby Sowles of Choice Designs at 3223 Carroll Road. "I think (what people want) is a little bit more of a classy look." For those interested in Halloween chic, Sowles says, the palette is changing – orange is still on the pumpkin, of course, but so is creamy white. To go with their pumpkins, people are choosing black, and even purple, along with metallic gold, silver, copper and bronze. 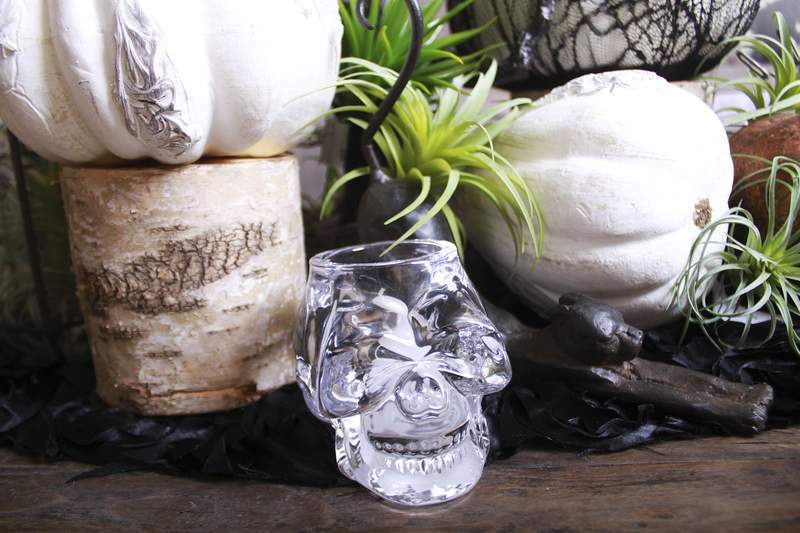 "We even have some neat-looking skeleton and skull decor with white, black and red, if you want to take chic to that eerie point," Sowles says. 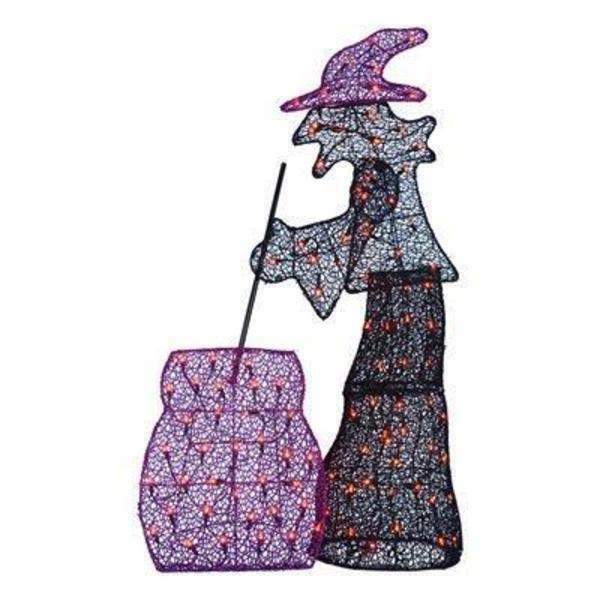 Despite the dark nature of the holiday, one common thread among the trendier Halloween trappings is sparkle. At Pier 1 Imports’ Fort Wayne locations (1750 Apple Glen Blvd. and 4224 Coldwater Road) or online (www.pier1.com), resides a black wood-curl wreath with orange sparkles at the tips, those curls looking like roses, for about $38. Six-inch glittery pumpkins in silver and orange are less than $7 each and brighten a mantel-scape or table centerpiece. Also at Pier 1 are glittery accessories for the couch. 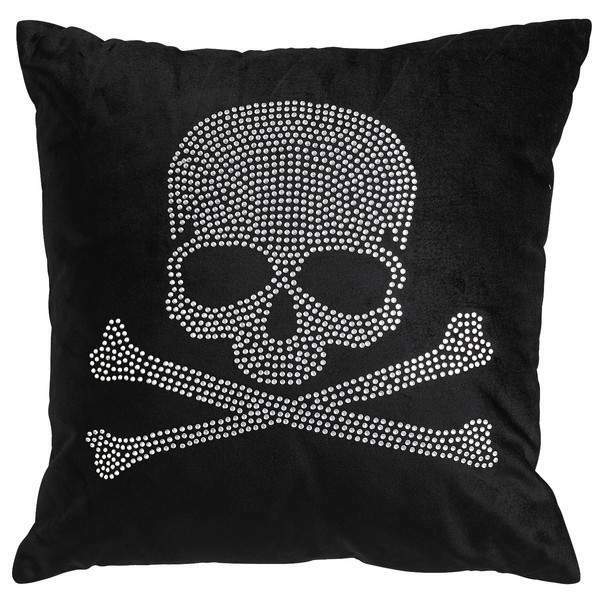 They include an orange-beaded pillow featuring two black ravens on a branch with a white crescent moon in the background, a blue-velvet pillow with a silver-and-black beaded spider and a black-and-silver beaded pillow with a skull design. All are less than $20, which the National Retail Federation found is the average celebrators expect to spend on decorations. Altogether, Americans are expected to dish out nearly $2 billion on decor this year, a poll by the federation found. Another upscale look adopts the Victorian/steam punk-style favored by trend-conscious Millennials. 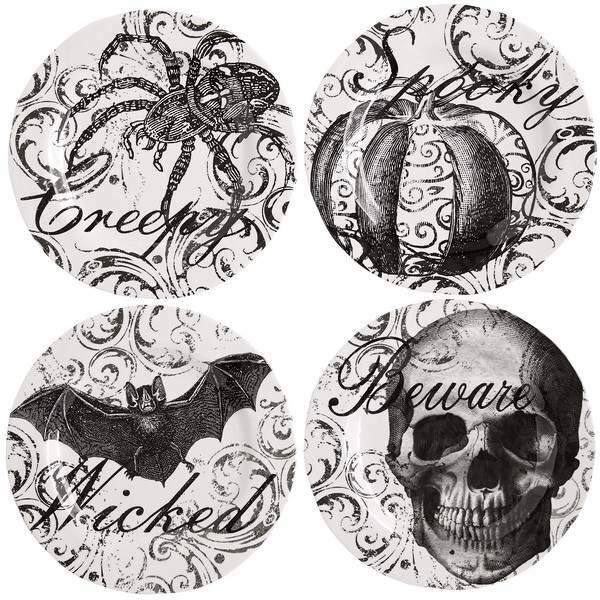 At Pier 1, white Melamine dinnerware for holiday parties is festooned with a skull, bat, spider and pumpkin and companion words such as "Spooky" and "Beware." The plates are designed to serve appetizers and cost $18.68 for a set of four; a companion candy bowl is available for the same price. To go with the tableware, Bed, Bath and Beyond (www.bedbathandbeyond.com) is showing black-lace linens – a table cloth, runner and topper and window and door panels and valances – in patterns featuring spider webs, bats, and skulls and a skeleton. 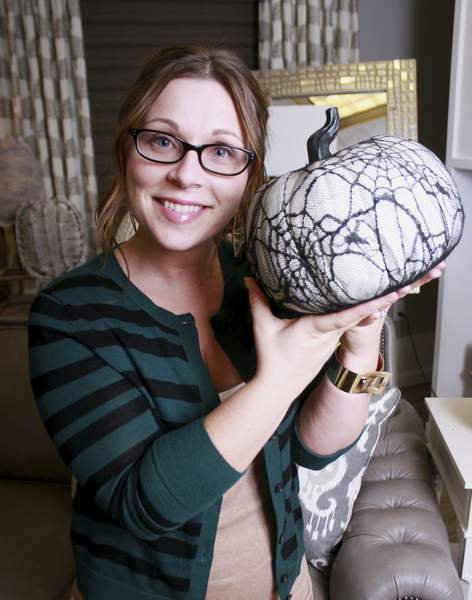 To go with that look are lace-trimmed resin pumpkins at Choice Designs. 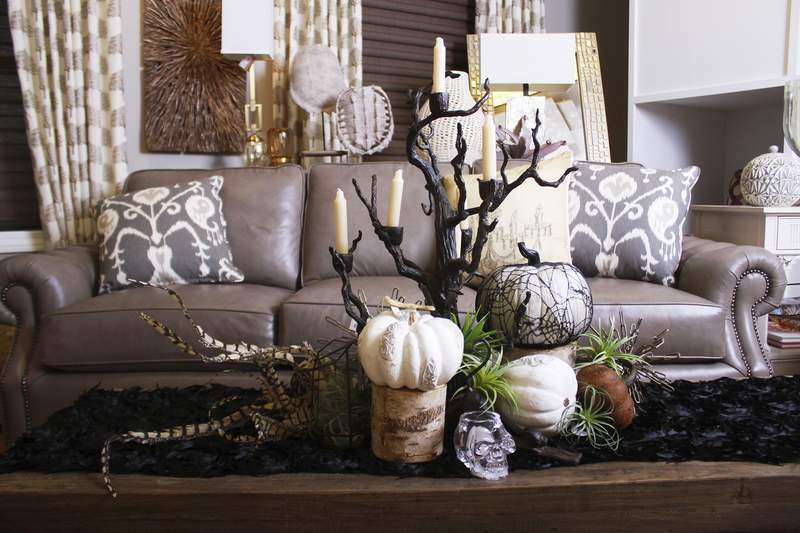 Still another trend, says Fort Wayne designer Cindy Friend of Cindy Friend Interior Design Studio, is the natural look. "Organic looks are trending, bringing in natural materials like burlap and twine," she says. Halloween is suggested with spice colors in the orange and brown families and black. Bed, Bath and Beyond combines natural burlap/linen-look pillows with printed Victorian or steam punk orange and black designs and lettered sayings by Heritage Lace. 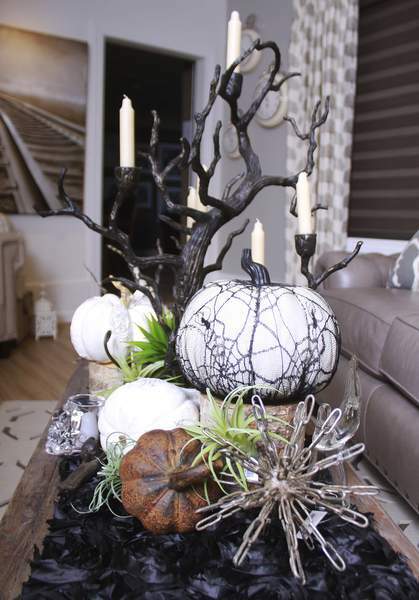 Choice Designs features black metal candelabras in the shape of twisted tree branches. 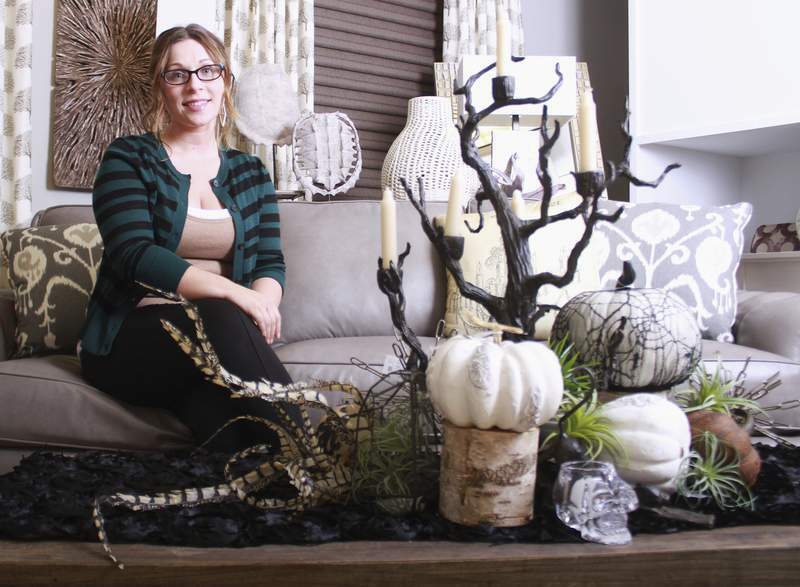 Tammy Baumgartner, in sales at Ossian Furniture Design in Pine Valley shopping center, says she thinks the Halloween chic trend has been spurred in part by older women whose kids have leapt from the nest – people, in other words, who want a more grown-up look for holiday parties. Another reason, she says, is that people want to stretch their decorating dollar. After all, those glitter pumpkins can easily turn into Thanksgiving decor, she says. "None of our stuff is the kooky scary stuff," she says. "I think people are trying to keep things more in a subtle way and not so kitschy, so that they can be changeable and make a smoother transition from Halloween to Thanksgiving," she says. "People like it when you can swap things out, and if you can make them last for a couple of seasons, that’s helpful."